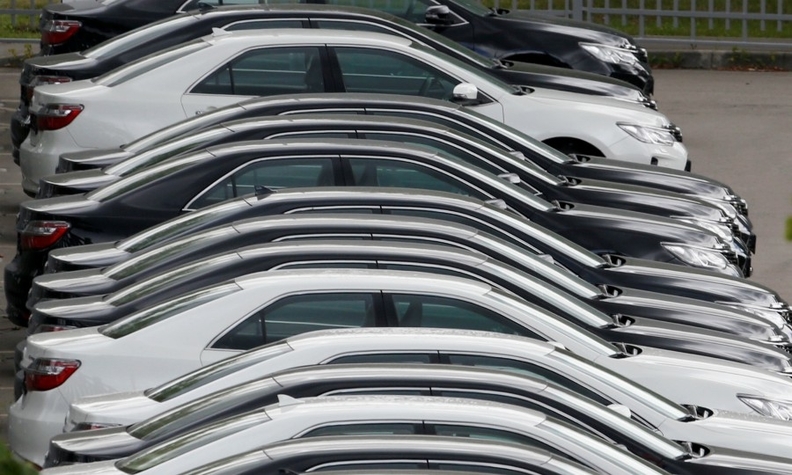 TURIN -- Italy's new-car sales dropped by 7.6 percent in January, as demand for diesel vehicles plummeted. Registrations were 164,864, according to Italy's Ministry of Infrastructure and Transport. The month had the same number of working days as January 2018. Gasoline cars accounted for the majority of registrations for the month for the first time since 2003. Gasoline car sales rose 28 percent to 74,722 for a 45.1 percent share, up from 32.5 percent in January 2018. Diesel sales fell 31 percent to 68,116 for a 41.1 percent market share, down from 55.3 percent year-on-year. The share of LPG-powered cars rose to 7.3 percent from 6.3 percent, while CNG-powered vehicles' share dropped to 1 percent from 1.8 percent. Hybrid electric cars took a 5 percent share, up from 3.9 percent; plug-in hybrid share was stable at 0.2 percent. According to UNRAE, sales of plug-in hybrids to private customers were limited as customers wait for incentives to cars emitting less than 70 g/km CO2; those incentives will kick-in from March 1st. Market leader Fiat Chrysler Automobiles' registrations dropped 22 percent with all brands except Lancia suffering declines. Fiat registrations fell 29 percent, Alfa Romeo lost 45 percent and Jeep was down 16 percent. Lancia posted a 55 percent jump and the Ypsilon, its only model, was the second most popular car in Italy after the Fiat Panda. Sales of the Ypsilon to private customers jumped 54 percent to 3,351, while demand from short-term rental companies grew fourfold to 1,629, according to Dataforce. PSA Group topped foreign automakers with Peugeot brand sales gaining 4 percent, Citroen up 2 percent and Opel posting a 10 percent increase; premium brand DS suffered a 4 percent decline. Altogether, the three mass market brands of PSA took a 18.2 share of the Italian market, just shy of the 18.8 percent share of FCA’s Fiat and Lancia mass market brands. Within the Volkswagen Group, VW brand registrations rose 11 percent, while Skoda was down 11 percent and Seat sales dropped by 6 percent. Audi and Porsche registrations fell by 37 percent and 59 percent, respectively. VW’s small SUV T-Roc jumped to fourth place among the market’s best sellers. Renault brand registrations dropped 14 percent, while sister brand Dacia sales jumped 26 percent, fueled by high demand for the Duster small SUV. Among the big Asian brands Kia posted a 9 percent gain. Other brands has a bad month. Nissan's registrations plunged by 36 percent and Hyundai sales fell by 12 percent and Toyota was flat (-0.35 percent). BMW and Mercedes-Benz both gained 1 percent. Dataforce and UNRAE forecast a further slight drop of the overall market in 2019 to 1.88 million. According to UNRAE, the worsening of the economy will more than compensate any positive effect the government hopes from the incentives to eco-cars. Last week ISTAT, Italy’s statistical office, said provisional data show Italy’s GDP slipped 0.2 percent in the fourth quarter, the second decline in a row.